BDSwiss are a fully regulated (CySec) broker. 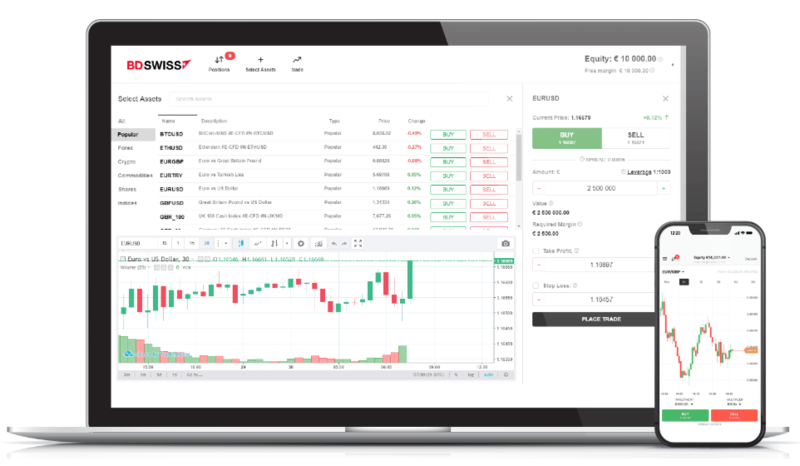 In our review we explore the trading platform, highlight the benefits of the demo account and explain why this brand can be used with confidence. The review also includes bonus and promo codes when available, and coverage of minimum deposit and withdrawal features, mobile app review, MT4 integration and login information. Read on the find out more. In light of the ESMA ban on binary options in the EU, BDSwiss have decided to withdraw binaries completely. They continue to offer forex and CFD trading. The trading charts on the platform use Line or Candlestick format. You may also choose among the following timestamp timeframes: 1, 5, 15, 30, 60 minutes and 4 hours, Daily, Weekly and Monthly. The platform for the Forex trading however is different and is much more advanced. You could compare it to MetaTrader 4 with loads of indicators, technical tools and many more settings. Payouts will vary based on the performance of the underlying asset, and the leverage used (if any). The list of assets with BDSwiss has been expanded significantly since the move to Forex and CFDs only. There is a full range of major currencies and commodities, plus the popular cryptos. BDSwiss does lag behind some larger rivals when it comes to asset list depth, but it is still growing. Live chat is available in English, German and Italian. In order to access Live chat, you need an email address and a username. Support is also available via email, and telephone. 16 languages are catered for with telephone support – a great level of coverage. BDSwiss offer clients free trading alerts. In addition to the trade directions, the signals also state a target entry point, and exit point. This helps traders time the market more accurately, and also show quickly if the signal has already moved. The trading alerts are a free service. Our usual advice applies – read the terms and conditions thoroughly. We found a couple of items to highlight: 1. Dormant account fee is applied after 6 months of inactivity. If you remain inactive after 6 months, a 10% fee will be deducted from your account ranging from minimum 25 Euros but NOT more than 78.90 Euros. Dormant fees are common, and a 6 month leeway is fair. If you think you will be inactive for a while, withdraw your balance. BDSwiss recently expanded their list of deposit and withdrawal methods. Their aim was to allow more users to be able to transfer money using the most familiar service to them. The main options of wire transfer, credit and debit cards, and ewallet providers deliver a good choice of payment method. BDSwiss, was established in 2012 and offers Forex, and CFD trading. They are regulated by CySec under the following License number: 199/13. Their registration number is: 300153 and their address: 23, Spyrou Kyprianou Avenue, Protopapas Building, 3rd Floor, Mesa Gitonia, CY-4001 Limassol.